Guterres to attend Arab summit following row over report accusing Israel of “apartheid”. UN Secretary General Antonio Guterres will visit Jordan next week to attend an Arab summit following a row over the release of a UN report accusing Israel of “apartheid”, AFP reported Wednesday. Guterres will arrive in Amman on Monday for talks with King Abdullah II and to visit a refugee camp ahead of the Arab League's annual summit near the Dead Sea on Wednesday, said a UN spokesman. Last week, Guterres denounced an Economic and Social Commission for Western Asia (ESCWA) report which accused Israel of imposing “apartheid” on Palestinian Arabs, demanding it be withdrawn. In response, Jordanian diplomat Rima Khalaf, who headed ESCWA, resigned from her post. The report had drawn criticism from Israeli officials, as well as from the United States’ Ambassador to the UN, Nikki Haley. Guterres's spokesman has denied that the request to Khalaf to withdraw the study was made under U.S. pressure. UN spokesman Stephane Dujarric said the report had been taken off the ESCWA website at Guterres' request because it was done without consultations with the UN secretariat. 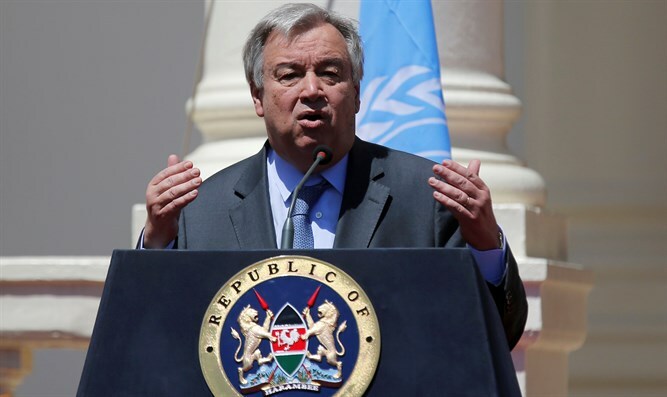 During his visit to the region, reported AFP, Guterres will hold a round of bilateral meetings on the sidelines of the Arab summit that are expected to focus on the wars in Syria, Yemen, Libya and the Israeli-Palestinian Arab conflict. During a meeting Wednesday with the UN chief, the Palestinian Authority (PA) envoy Riyad Mansour said a group of Arab ambassadors expressed their dismay at "some people who are trying to inject bullying tactics and intimidation" at the United Nations, in a veiled reference to the United States. Mansour said, however, the Arab group had agreed with Guterres to "move on." PA officials denounced the UN for removing the “apartheid” report, accusing Gutteres of “succumbing to political blackmail”.